Peering into the mother of all shipwrecks at the new Discovery Times Square Exposition. 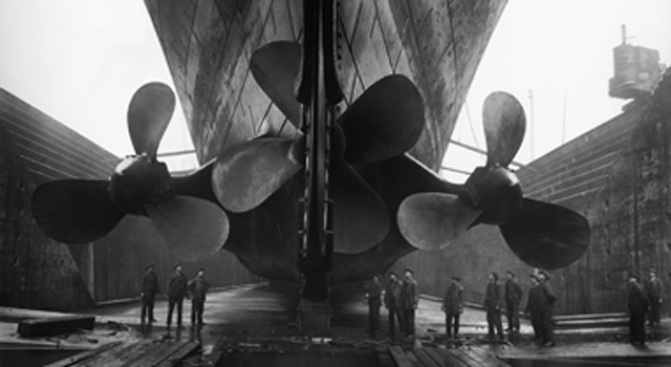 "Titanic: The Artifact Exhibition" opens today at the Discovery Times Square Exposition. Whether you’re a nautical history nut or one of those people who saw James Cameron’s record-breaking epic more than twice, "Titanic: The Artifact Exhibition" at the Discovery Times Square Exposition (the nifty 60,000-square-foot museum of sorts that opens to the public today) is worth experiencing. Not only will you get to peek at more than forty never-before-seen artifacts from the shipwreck, you’ll get to walk through recreated rooms (such as the sweeping staircase or a first-class state room) and observe minute details like “uncorked Champagne bottles […] and personal effects such as straight razors and combs that humanize the experience,” according to the NY Post. But the exhibit has a genius interactive spin: Your ticket doubles as a boarding pass belonging to one of the ship’s real passengers – and only at the exhibit’s end will you get to find out if “you” made it into one of those lifeboats. Gimmicky and ride-like? A little. But drawing people into a first-hand experience of history is never a bad thing. More on theTitanic exhibit at the NY Post – including a photo gallery -- here. For tickets and furhter information, head to discoverytsx.com.